Peach obsession. That’s what I’m dealing with right now. A serious peach obsession. I’ve been downing these guys like it’s some kind of marathon. I went to the gym to work out the other night (I know, weird) and when I came home the first thing I did was go to the fridge and grab a peach. “But didn’t you want a glass of water?” someone less strange than me might assume. Nope. I had to have a peach. I picked a huge one I had just picked up from the market a couple of days before and my decision was rewarded big time with cold juicy sweetness. It was so ripe I nearly squealed with delight. Since I’m incapable of getting sick of this crazy wonderful fruit I have been making something with peaches weekly. 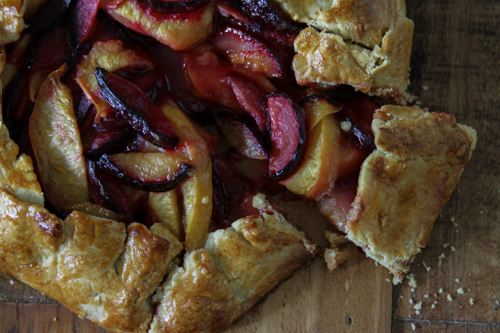 Lately I’ve been making a peach and plum galette that is simple but beautiful and oh so summery. Plums can be an underrated fruit, in my opinion, but I’ve been getting some really fantastic ones at the market this year. Like peaches, plums are just as wonderful when eaten right after being picked from nature’s bounty but they are equally wonderful featured in baked desserts. You get a magnificent burst of hues from magenta to dark purple and the deep red juice rolls along the crust amplifying striations of a homemade kind, the kind that speaks to a person’s love affair with the kitchen. It’s one of those desserts that is both fun and easy to make, yet it receives all sorts of oohs and aahs from those that discern you must have spent an eternity slaving away in the kitchen. You will know better and smile in proud satisfaction. *European butter or American butter with a higher fat content recommended- trust me, it makes a big difference. I use Kerrygold which is now very easy to find. Plugra also works great. *You can use whatever mix you like. I use yellow peaches, red plums, and black plums. This mix gives great color variation! Put a few tablespoons of water in a glass with a couple of cubes of ice and set aside. Pour 1 cup all-purpose flour, the cornmeal, fine sugar, and salt into a food processor and pulse several times to mix. Add the cubes of cold butter to the mix and pulse until the mixture starts to turn a bit yellow and is coarse meal texture. Slowly add 1 tablespoon cold water while continuing to pulse mixture. If needed add up to 1 additional tablespoon until the dough starts to pull together. Do not overmix. Lightly flour a counter or work surface and turn the dough out onto the floured surface. Knead the dough a couple of times and then form a disk. Wrap the disk in plastic and put in in the fridge for at least an hour. I often make the dough the day before I need to make the galette to get it out of the way and the next day it’s there ready for me. When you’re ready to make the galette, take the dough out of the fridge 30 minutes before you want to roll it out. Set the oven to 400 degrees Fahrenheit. Tear off a large piece pf parchment paper and place it on a work surface. Lightly flour the parchment paper and a rolling pin. Place the dough on the parchment paper and roll the dough out to 14 inches round, starting from the middle and rolling in each direction. Repeating this will give you an even thickness. It may crack at the edges and that is okay. Just mend the cracks as you work. This is a rustic tart. Don’t worry about it too much. Imperfection is great here. Transfer the parchment paper with the dough onto a rimmed baking sheet (nonstick preferred) and set it aside. 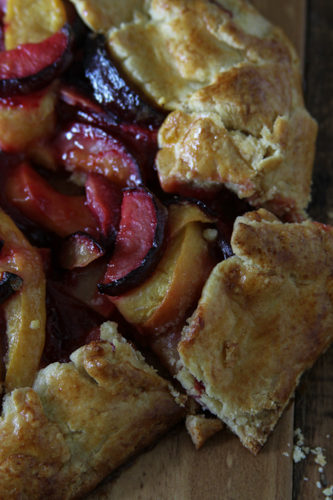 In a large bowl mix the thinly sliced peaches and plums, 1 tablespoon all-purpose flour, and the 1/3 cup coarse sugar. Mix well but be gentle so you don’t break the fruit. Pour the fruit filling into the very center of the dough, piling high rather than spreading out. Use your hand to gently push the filling down so it spreads out evenly. Leave a 2 inch border from the edge of the dough. Fold the border up pleating it as you go (once again, don’t get frustrated and strive for neat here. Just fold that thing up and however it falls will be beautiful). You may get a few cracks. Just mend quickly so the juice from the fruit filling doesn’t start to run through. Brush the dough with the egg wash. Bake the tart for 40-45 minutes until the crust is golden brown and the juices from the fruit are bubbling. Transfer baking sheet to a cooling rack and let it cool for 15 minutes. Slice and serve! 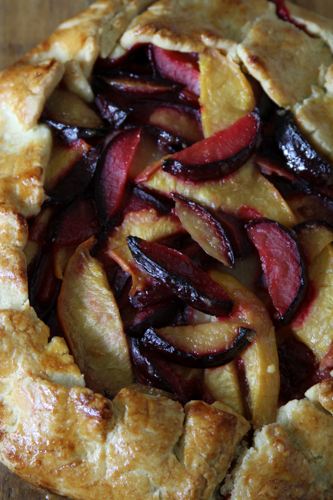 *The galette can be served both warm and at room temperature. It will keep in the fridge up to 5 days. © 2012 The Picky Pantry. All rights reserved.. Simple theme. Powered by Blogger.